There are so many "must have" travel gadgets for business travelers out there but are they all really necessary? The short answer is No. Doing business is not about the gadgets you have. It is about connections and communication, the ability to spot opportunities, to be able to close deals, etc. People have successfully done business in the past without any of those business gadgets. There is though no question that some business gadgets can help you do your business more efficiently. And as all business people know, time is money. We are experienced business travelers and the following are some great business travel gadgets we know have / would benefit us greatly when travelling on business. You might not realize how much noise is onboard an airplane until you try putting on noise cancelling headphone... and then take them off. Being able to block out the unwanted sound onboard will allow you to concentrate better on your work, rest better or enjoy more relaxing with your chosen entertainment... the choice is yours. The sound quality is important when choosing your noise-cancelling headphone. It is also important that they are comfortable to wear, lightweight and you should ideally be able to fold them neatly. Being able to hear the in-flight announcements without taking them off is also a bonus. We love our in-flight noise cancelling headphones when travelling. We used to struggle sleeping on planes so they have really made a big difference for us, i.e. helped us to rest better on long flights. We don't know about you but some of us are very slow working on small keyboards like on smartphones and tablets. This is why we love our travel keyboards. You can get extremely light and compact travel keyboards that work with virtually any Bluetooth-ready device. It is guaranteed to get you up to speed when working while travelling. This is a business travel gadget that we don't want to live without because now travelling with smartphone or tablet instead of a laptop is a real option for us. There are many cell phone accessories available, some are very beneficial travel gadgets for business travelers, other not so much. Good phone protection cover is necessary when travelling, as is being able to charge your phone on the go (power monkey). While extra camera lens is unlikely to be necessary for most business travelers, it is still great little gadget that can allow you to get so much more out of your phones camera. The same applies about travel speakers. They are strictly not necessary on business trips but can still make your trip so much more enjoyable. If you need to make a presentation on your business trip, you may not want to rely on getting access to projector at the other end. There are many lightweight portable travel projectors available for those business travelers that want to arrive prepared. One thing we never travel without whether on business or leisure is a set of travel adaptors. Adapters are cheap and widely available but if you travel frequently, like most business travelers do, then you want to own your own set of travel adaptors that you can use anywhere in the world. The same applies about converters. When choosing your travel adapters and converter kit make sure they cover all the regions you travel to and are as lightweight as possible. There are so many other great travel gadgets for business travelers available, these are just some of our favorites. We seem to have more and more electronic gadgets with us on ever trip, which also means more cables, charges, etc. Keeping small portable electronics protected and organized is therefore important and that's why we like the idea of special packing travel case for electronics. It will free up the packing cube we have until now used for this purposes. We got ten thumbs where touch-screen devices are concerned so if you are like us, then you will like the Stylus Pen. It allows you to precisely operate any touch-screen device, without scratching or smudging the screen. Many travelers use their cell phones as alarm clock when travelling. That is fine as long as you turn your phone off, as texting beeps can interrupt your sleep. There can however be advantages of using special travel alarm clock, e.g. Sonic Boom world time alarm clock. These are just few business travel gadgets that may be beneficial for you on your business trip. 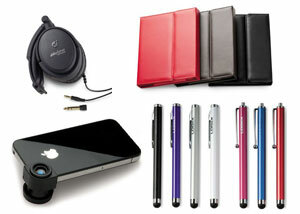 Visit our Travel Shop for more travel gadgets and in-flight comfort products for business travelers.